This priest is a member of the clergy. A clergyman or clergyperson. The definition of clergy are people that have been trained and approved for religious service. 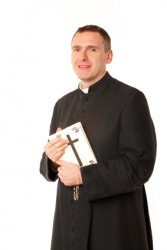 An example of clergy are priests. "clergy." YourDictionary, n.d. Web. 13 April 2019. <https://www.yourdictionary.com/Clergy>. The body of people ordained or recognized by a religious community as ritual or spiritual leaders. See Usage Note at collective noun. Body of persons, such as ministers, sheiks, priests and rabbis, who are trained and ordained for religious service. Today we brought together clergy from the Wiccan, Christian, New Age and Islamic traditions for an interfaith dialogue. Attested in the 13th Century CE; from clergie, from Old French clergié (“learned men”), from Late Latin clericātus, from Latin clericus (“one ordained for religious services”), from Ancient Greek κληρικός (klērikos, “of the clergy”). The clergy left the matter to the tsar's own decision. It became clear that neither the influence of the regular clergy, of which the Society of Jesus is the most powerful embodiment, nor that of foreign clerical parties, which largely control the Peters Pence fund, would ever permit renunciation of the papal claim to temporal power. Having refused to accept the civil constitution of the clergy, Dillon had to leave Narbonne in 1790, then to emigrate to Coblenz in 1791. 27, 1673) suspended the Hungarian constitution, appointed Johan Gaspar Ampringen dictator, deprived 450 Protestant clergy of their livings and condemned 67 more to the galleys.